So begins this picture book guide to everything you need to know to train your new pet train. First you need to find the train that is just right for you. Then you need to choose a name (Morgan? Smokey? Little Miss Muffinhead?) Next is the fun part – games and tricks and spending time together. Before you know it, you and your new train will be the best of friends. This whimsical twist on owning a new pet by Jason Carter Eaton is delightful to read. 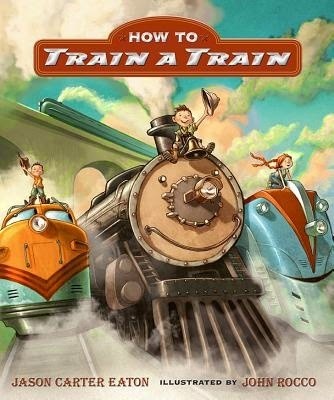 How to Train a Train is the perfect gift for a young child who loves trains, but it really has a broader appeal than just train enthusiasts. Children and adults will enjoy the quietly humorous text and illustrations by John Rocco and kids will love the concept of a train engine doing everything a pet dog could do. I bought this book for my train-obsessed 10-year-old son. Even though he is older than the target audience, we have still enjoyed some smiles while reading the story. If you are trying to find a train picture book that is light-hearted, fun and a little different to the usual selection, How to Train a Train is for you.